If you own a vehicle, sooner or later you’ll need the help of a mechanic — it’s a common part of vehicle ownership. But what do you ask a mechanic if all you know is there’s an odd or unusual noise coming from the car? The auto accident attorneys with The Law Offices of Michael B. Brehne, P.A. know a trip to the mechanic doesn’t have to be a formidable task when you’re prepared with car repair questions to ask. 1. Do You Have Experience With Cars Like Mine? While it’s a common belief mechanics can work on every vehicle that comes into the auto repair shop, the truth is some can and others specialize in certain makes. Older and/or less commonly found vehicles are frequently repaired by specialized mechanics. Even if a mechanic isn’t able to work on your vehicle, ask if they can recommend a different repair shop. 2. What Professional Certifications Do You Have? Most mechanics hold one or several professional certifications, such as from the National Institute for Automotive Service Excellence (ASE) and the Automotive Service Association (ASA). Depending on the organization, mechanics may need to receive periodic training and testing to continue the certification or observe a code of ethics. Some automotive manufacturers also offer special certifications for their specific brand. 3. Can I Have An Estimate Of The Cost? If the mechanic scoffs or quickly answers no to this question, find another mechanic. Every estimate should be willingly given and in writing, explaining all costs for parts and labor. Don’t be afraid for a line-by-line explanation and whether the listed repairs are necessary or suggested. 4. Do I Have Any Say On What Parts Are Used? The parts of any vehicle are generally manufactured by the car company itself, called original equipment manufacturer, or a third party called aftermarket parts. Some mechanics want to only use parts they select while others let the car owner have a say on what’s used. Keep in mind certain parts may or may not be covered by a warranty. But regardless of what parts are used or where they come from, you should always be informed on what and why they’re used on the vehicle. 5. How Did You Fix The Problem? This question is a great way to start building a personal rapport with a specific mechanic. It gives them a chance to explain, in technical terms, what the issue was, how it was discovered, and what methods or how they repaired it. Plus, once the relationship is started, you can have the same mechanic work on the vehicle each time — this means they’ll learn any particular quirks the vehicle may have and immediately know how to handle it. 6. What Could Happen If I Don’t Have The Repair Done? It’s true some repairs don’t require immediate attention but others shouldn’t be ignored or put off. Ask a mechanic if your particular repair needs prompt attention or if it could be handled in a couple thousand miles. 7. What Repair Options Do I Have? The majority of vehicle issues can be fixed with a variety of approaches. Unfortunately, some mechanics try to steer customers toward the most expensive — or complex which often means expensive — repair. Ask the mechanic about all possible solutions and to explain each in depth. That way you’ll have the full picture of the options and be able to make the best decision. 8. Can You Show Me What’s Causing The Noise? Some issues, such as electrical, might not have a physical location to show but can still be thoroughly explained. 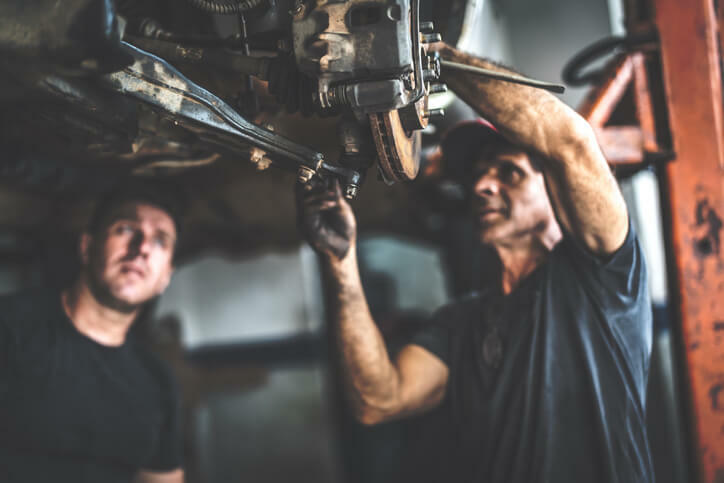 Others can be physically pointed out — a trustworthy mechanic will then take the opportunity to explain how the part affects other components in the vehicle’s operation. 9. Do You Offer A Warranty? Depending on the auto repair shop, you may receive a warranty or a guarantee for the work performed. A warranty is a promise particular criteria, such as a specific repair, will be met. If the repair would fail, for example, then the mechanic or shop would repair or replace the work. Many guarantees are structured the same way but vary in choice of words used. 10. What Would You Do If It Was Your Vehicle? A good mechanic does more than simply repair a laundry list of common mechanical problems in vehicles. They also act as an advisor to customers and help them make the best decisions for their situation and vehicle. A frequent example is helping you decide whether a certain repair is worth the expense.